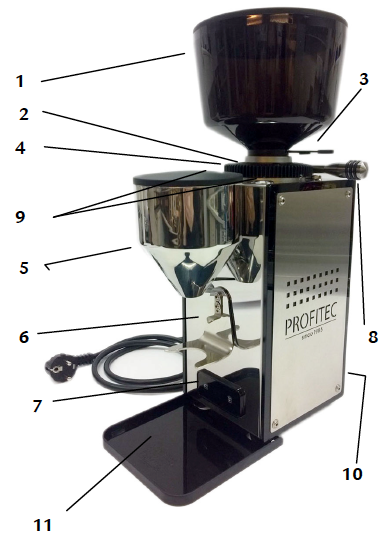 Thank you for purchasing the Profitec T64 espresso grinder. In this user manual, you should find everything you to need to operate and maintain your machine. 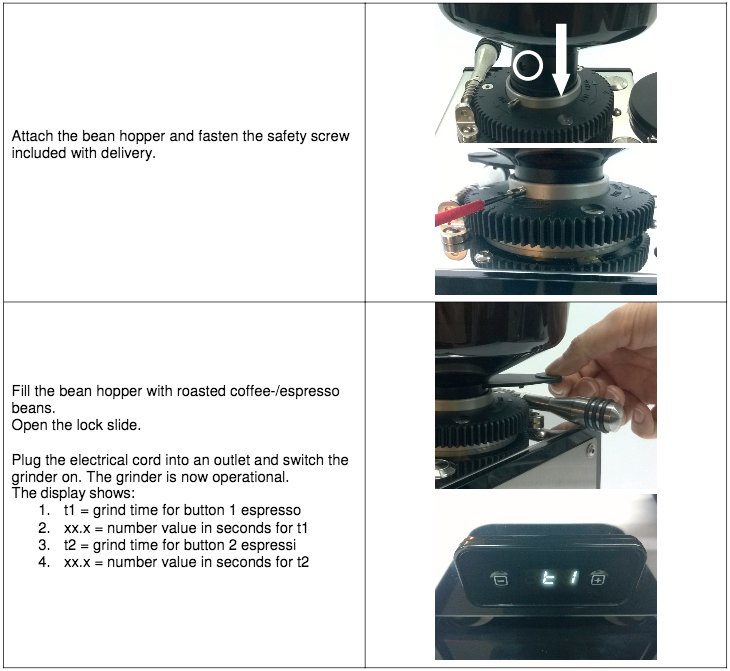 Please read carefully before using your Profitec T64 espresso grinder. And if we've missed anything, you always know how to contact us. Let's get started! Make sure that the local main supply voltage corresponds to the information given on the type plate on the bottom of the coffee grinder. Always fasten the bean hopper with the safety screw. Carry out the installation of the grinder according to the instructions. Plug the grinder into a grounded socket only and do not leave it unattended. Do not roll or bend the power cord. Always remove the electrical plug from the outlet prior to conducting maintenance or cleaning work on the grinder. Do not use an extension cord/ do not use a multiple socket. Place the grinder on an even and stable surface. Never place the grinder on hot surfaces. The grinder should only be used by experienced adult persons. The grinder is not intended for use by persons (including children) with reduced physical, sensory or mental capabilities, or lack of experience and knowledge, unless they have been given supervision or instruction concerning use of the appliance by a person responsible for their safety. Do not expose the grinder to inclement weather (frost, snow, rain) and do not use it outdoors. Keep the packing out of reach of children. Stopping the grinding process – Press one of the grinding buttons You can stop the grinding process by pressing either of the grinding buttons during timed grinding. Cleaning of the housing and the bean hopper - Occasionally clean the housing and the tray with a damp cloth. You should clean the bean hopper with a cloth prior to refilling the hopper in order to remove coffee oil residues. These residues can negatively effect the flavor. Cleaning of the burrs - Please use Urnex Grindz cleaner as directed. 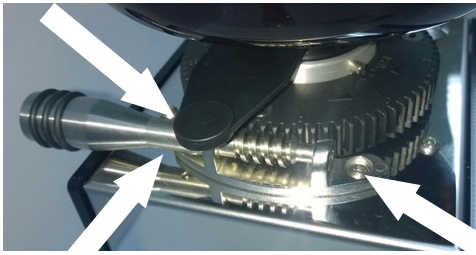 Should a bean become stuck in the grinding mechanism, you may easily fix this yourself. Adjust the grind to a coarser degree. 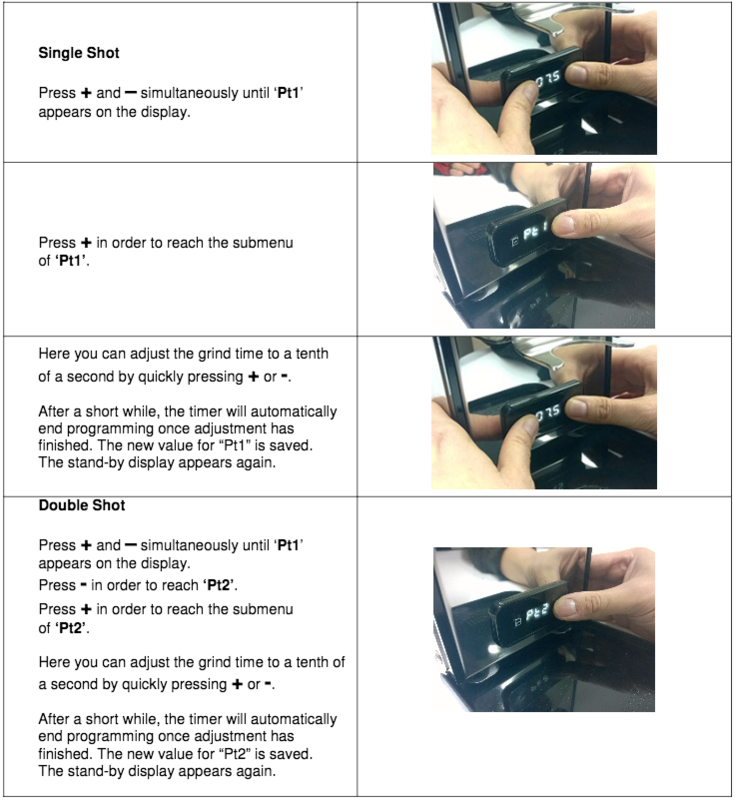 Turn the grind adjuster counter-clockwise by two full turns. Press the grinding button and grind coffee. The stuck beans should now come loose. Switch the grinder off and unplug the electrical cord. Loose the screw of the adjustment of the grinding level (1,5 mm Allen wrench). Loosen both screws that are, or were, holding the grind adjustment bracket (2.5mm Allen wrench). Position the bracket as close to the gear wheel as possible and tighten both screws again. Tighten the screw of the adjustment of the grinding level again.